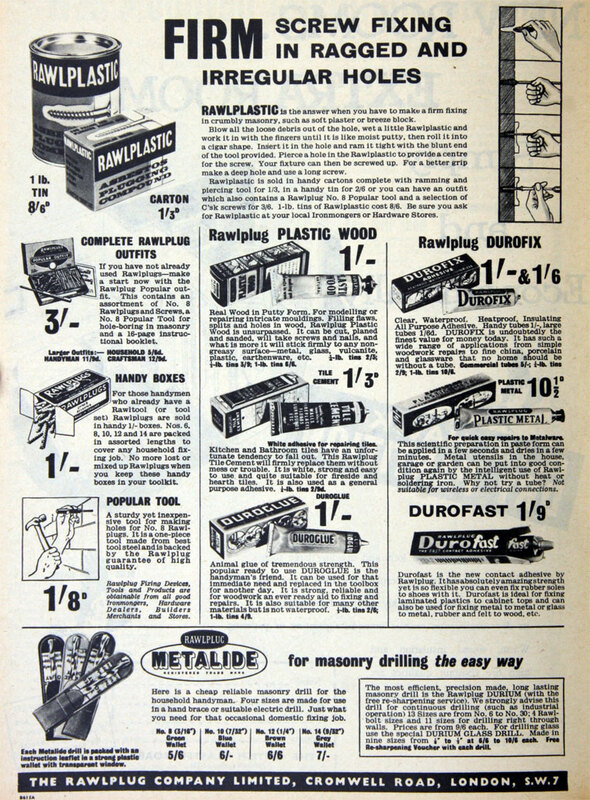 April 1945. 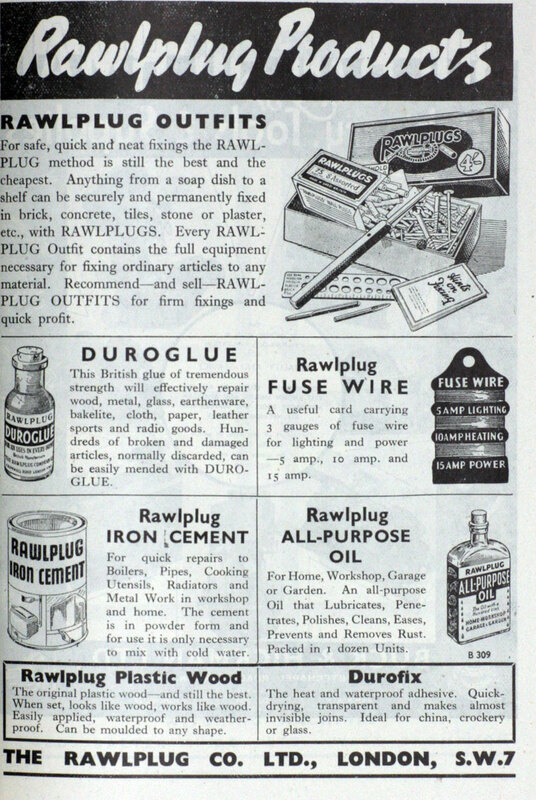 Rawlplug Paint Co.
Feb 1947. 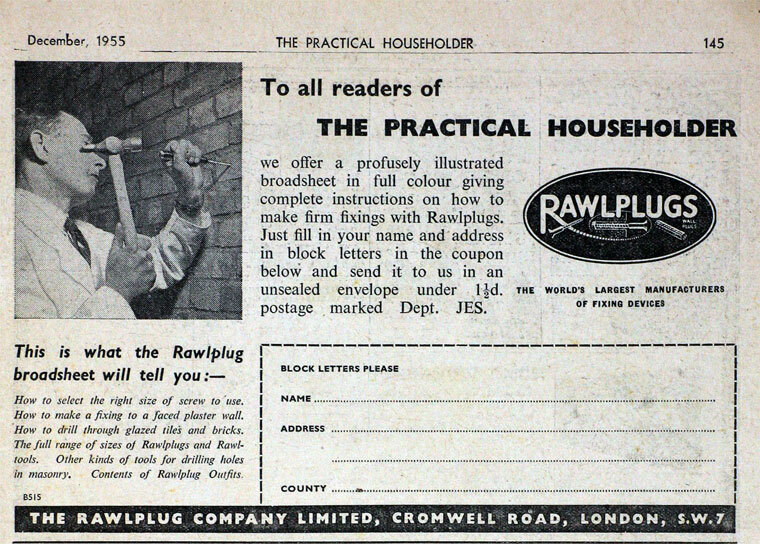 Rawlplug Paint Co.
of Lenthall Place, Gloucester Rd., South Kensington, S.W.7. 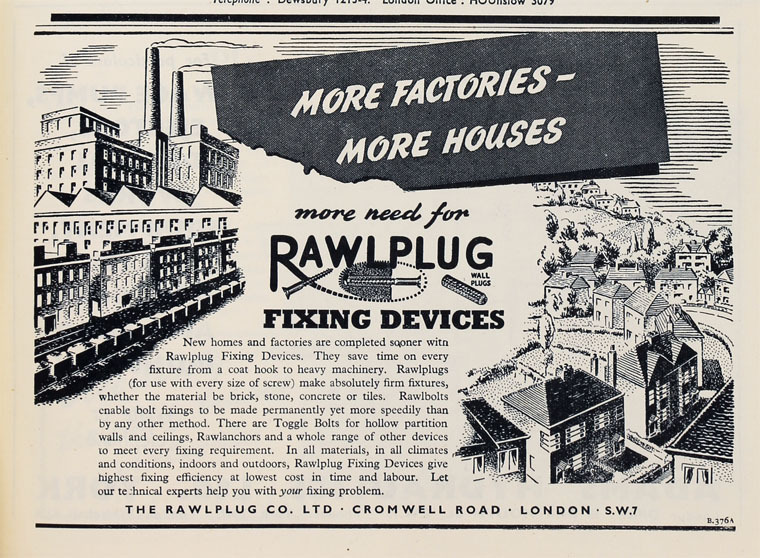 of Rawlplug House, Cromwell Road, London, SW7. Telephone: Frobisher 8111 (10 lines). 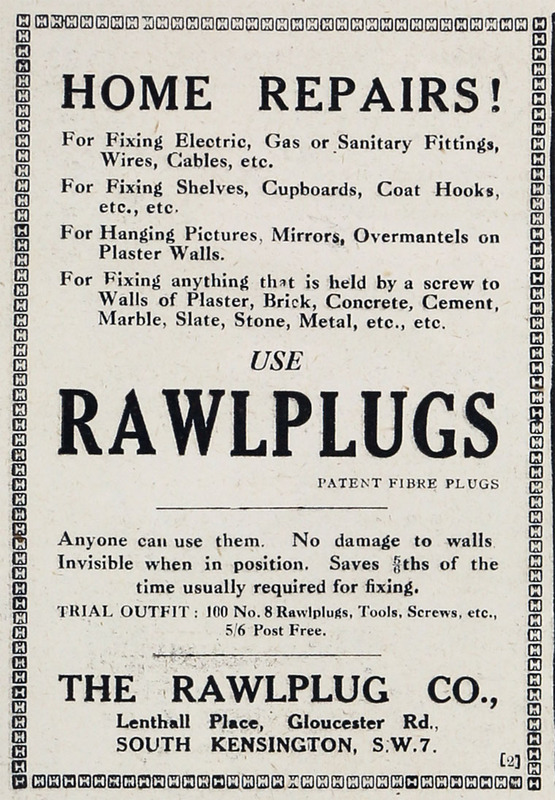 Telegraphic Address: "Rawlplug, Southkens, London"
c.1917? 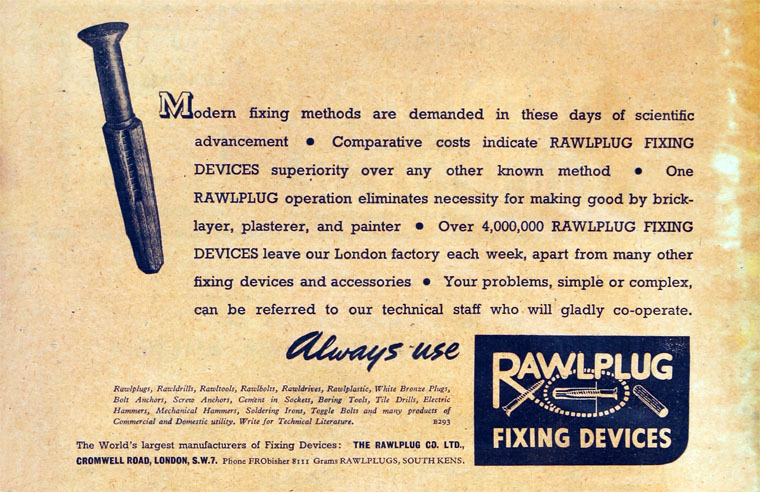 A small fixing problem in the British Museum is said to have led to founding of the Rawlplug Company Limited - the world first fixing company. The Museum needed electrical fittings fixed to walls unobtrusively and without causing damage to the masonry. 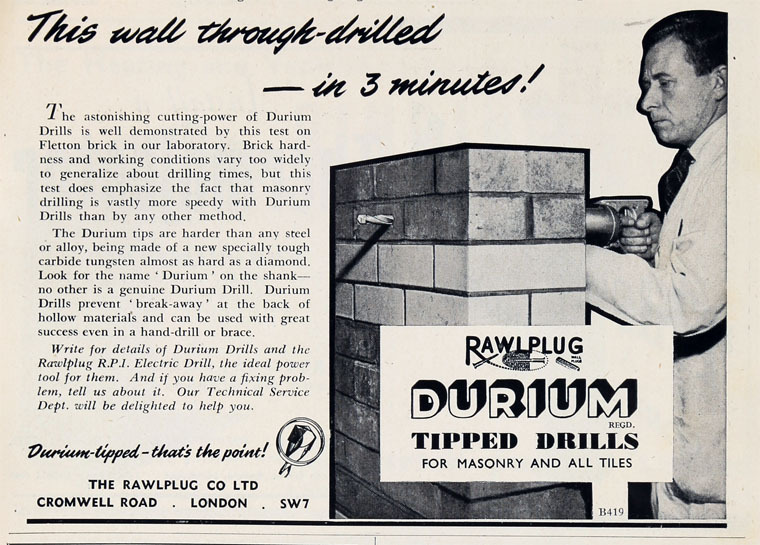 This was difficult using the traditional method - chiselling a hole in the masonry, plugging it with wood, and screwing the fitting to the wood. 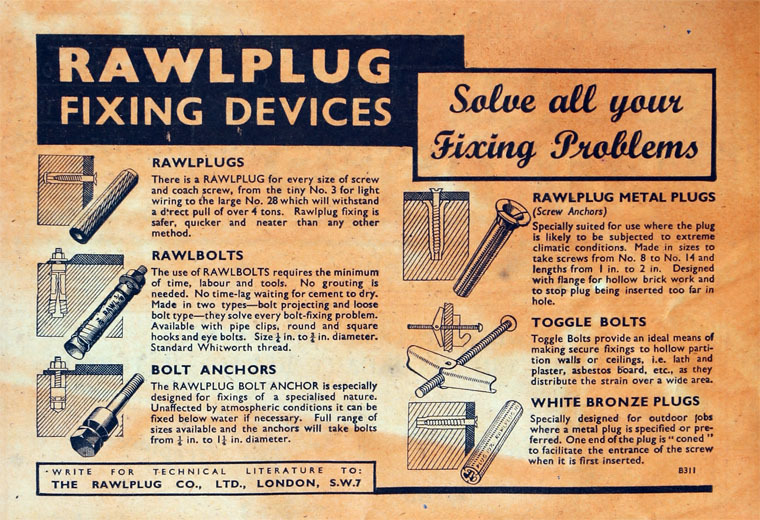 John Joseph Rawlings, a building contractor, solved the problem by inventing the fibre plug - known as the Rawlplug - into which screws were driven. 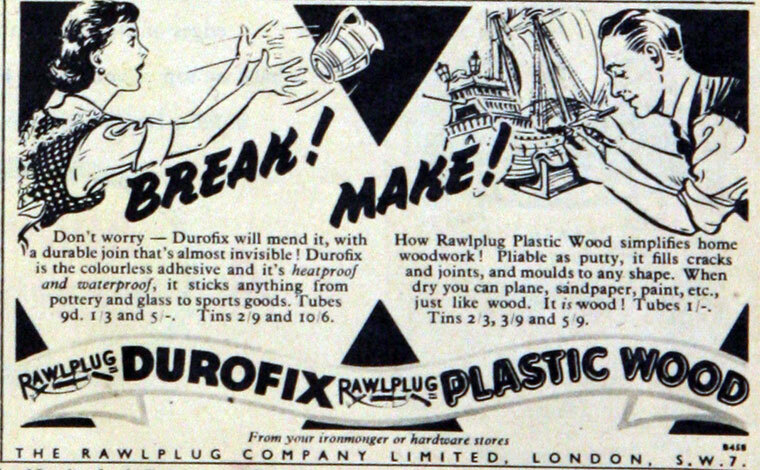 The basic principle in the design was grip by expansion. 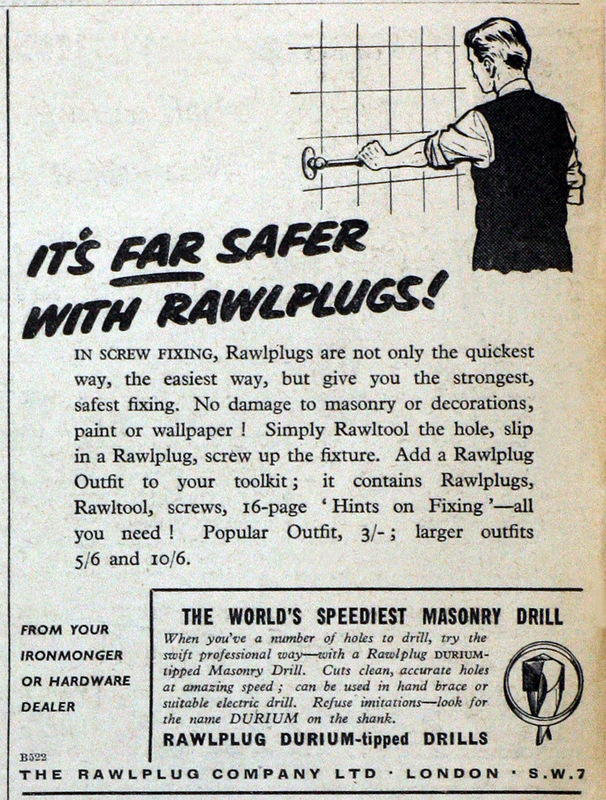 Each screw had its own size of plug which was designed so that it expanded to the maximum as the screw was tightened up into the plug. 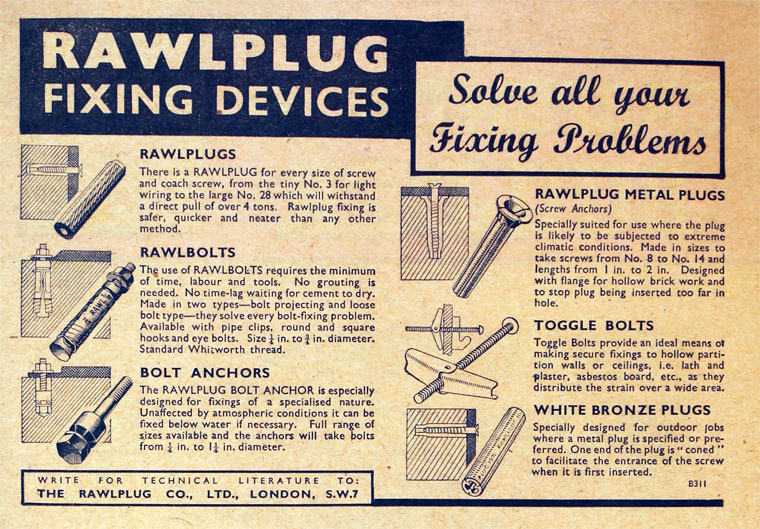 The first Rawlplug fixing consisted of a brass strip stamped in four sections with a thread on each section. 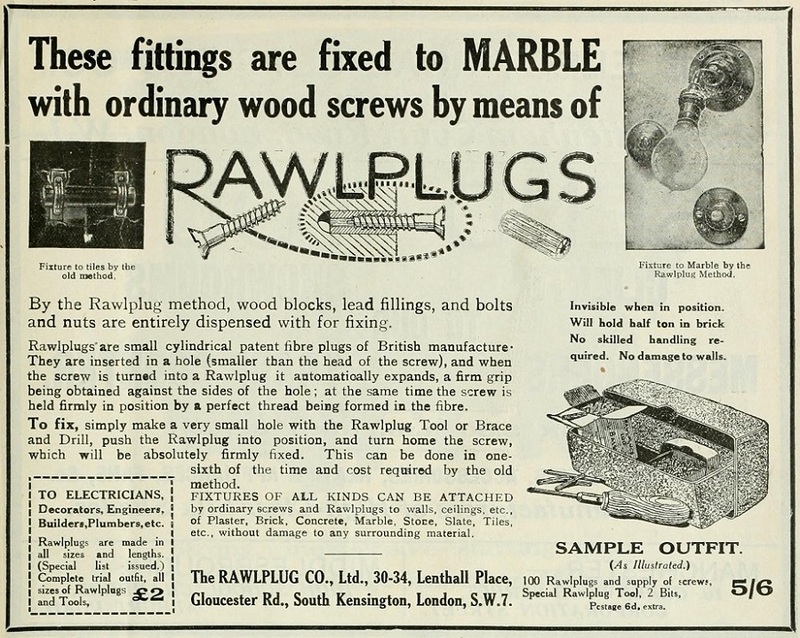 The sections were then folded and placed with the screw in the hole and expanded under the action of the screw. 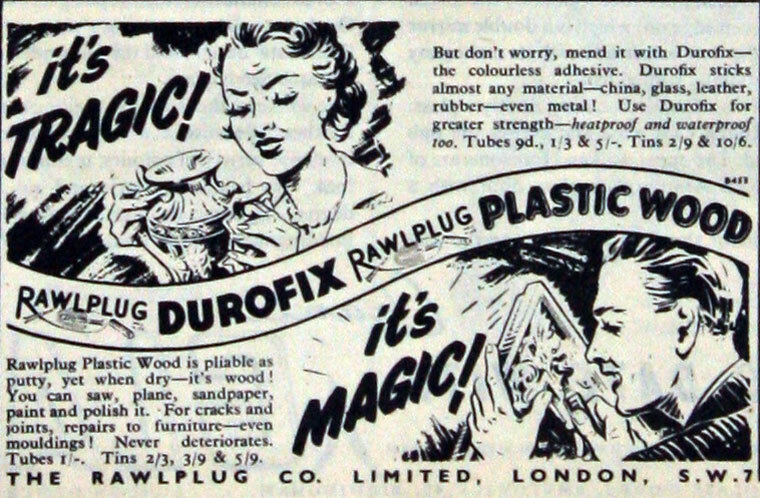 The next step was to use fibre that was found to be an ideal substance chiefly due to its resilience and tenacity. 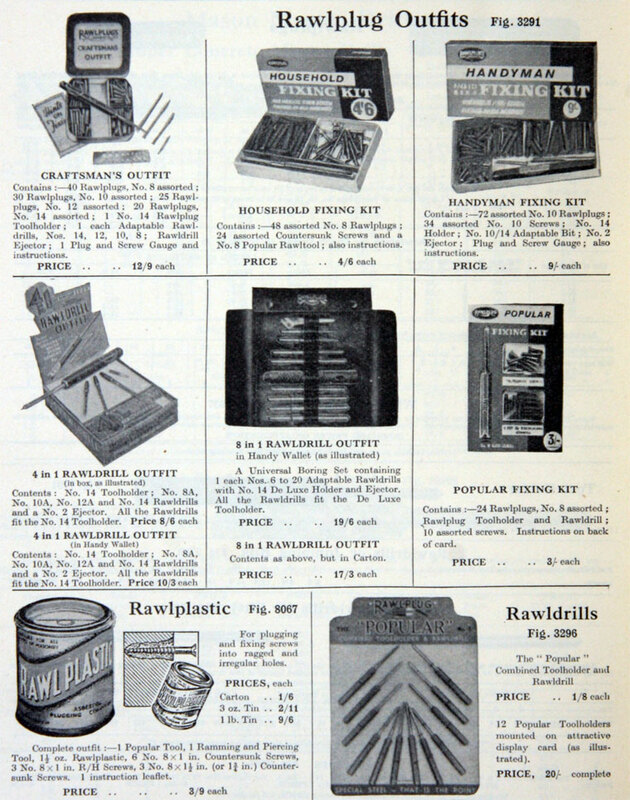 Hemp and string were laid lengthways on a mandrill and bonded with glue. 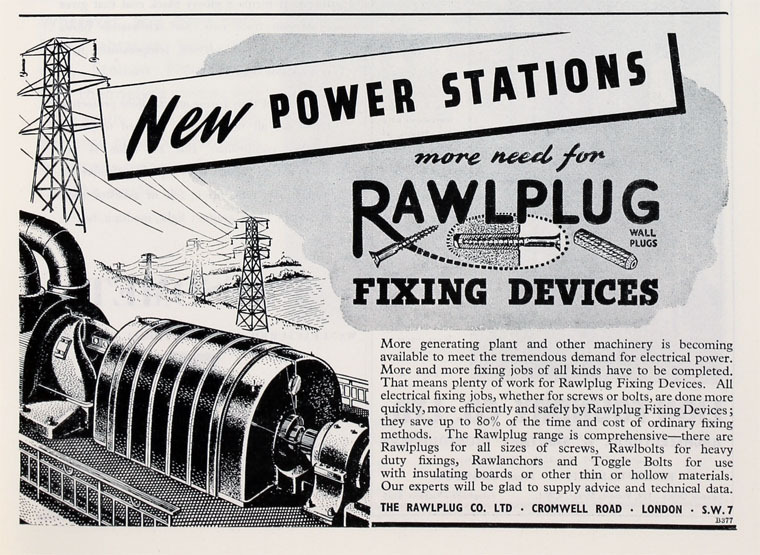 What advantages did the Rawlplug offer? 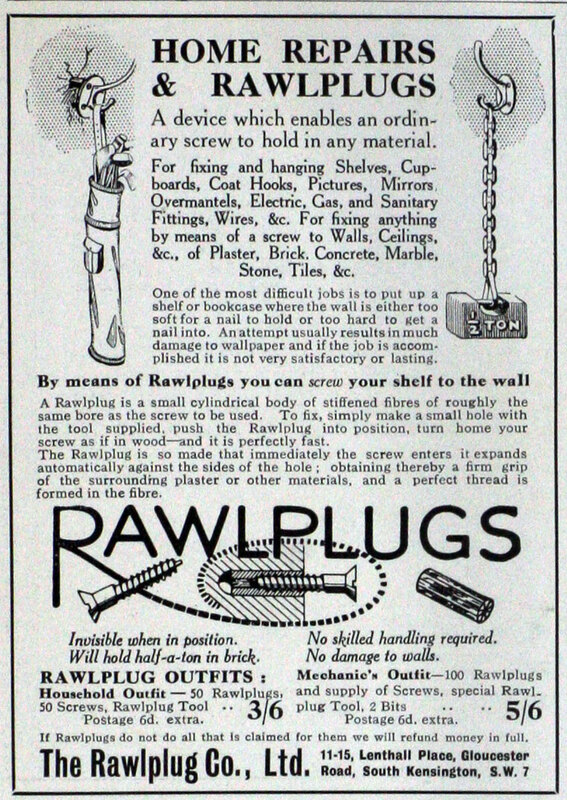 Only a small hole was needed to accommodate the plug - this could be made easily and quickly. 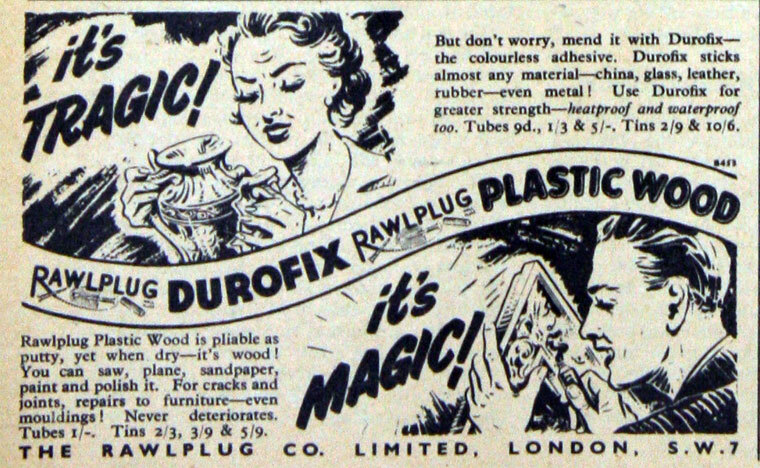 The screw could be driven into the Rawlplug just as simply as if into wood but the fixing immensely stronger - in fact as strong as the screw itself. 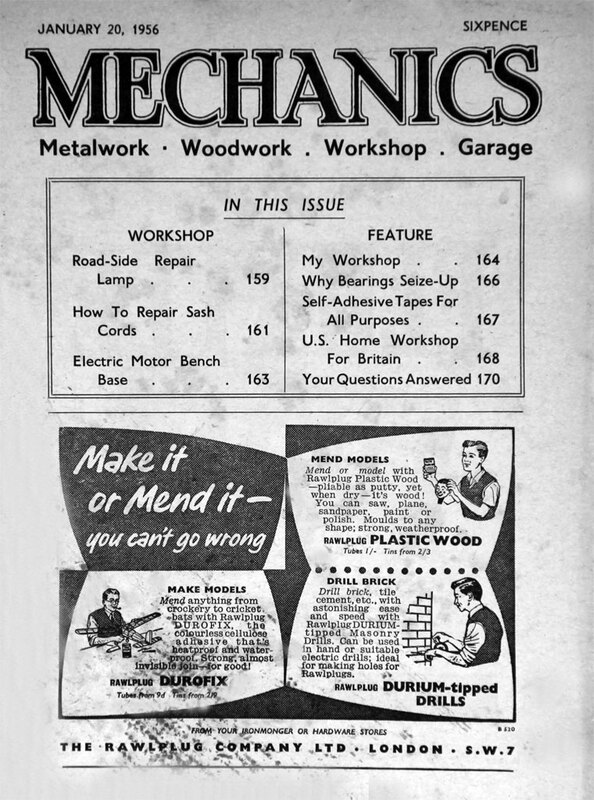 It was a much neater method of fixing. 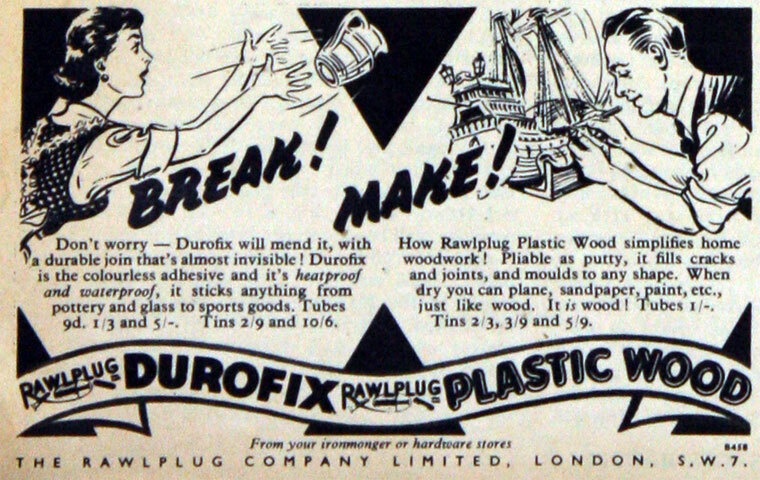 Only a small hole was required, whereas the conventional method was to chisel a large hole into which was driven a bulky wedge of wood. 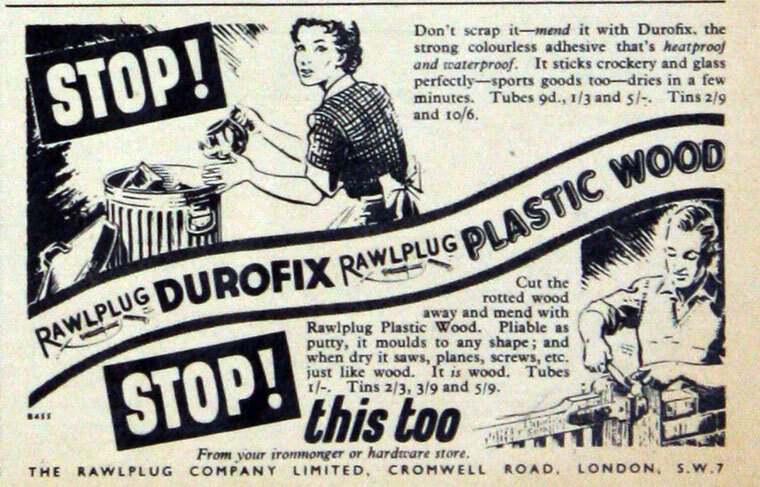 The fibre Rawlplug had come to stay. 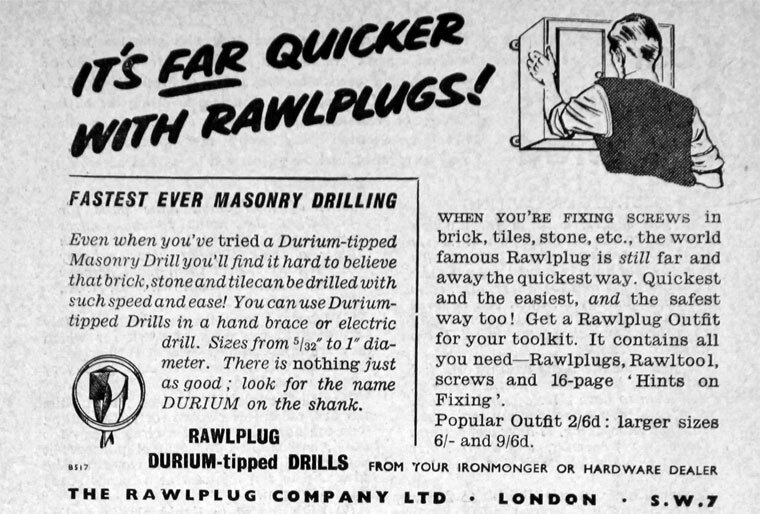 Suitable for all types of masonry, it provided a simple answer to thousands of fixings problems. 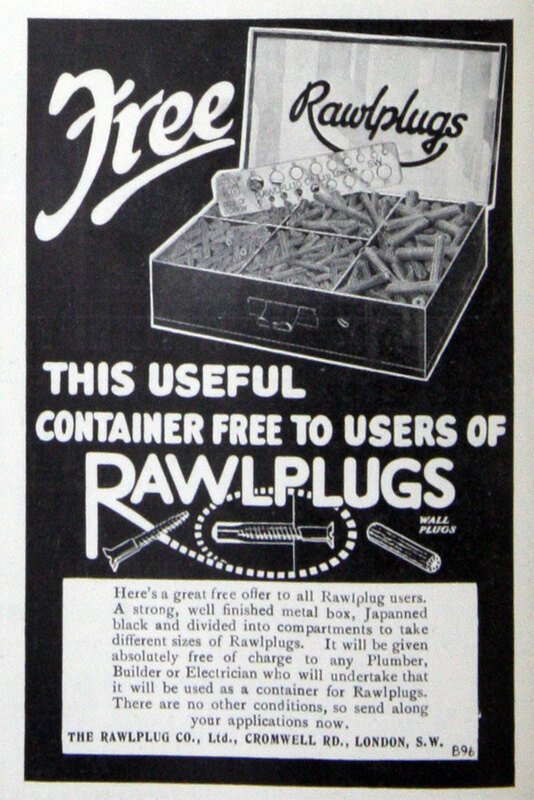 The plug met with immediate success. 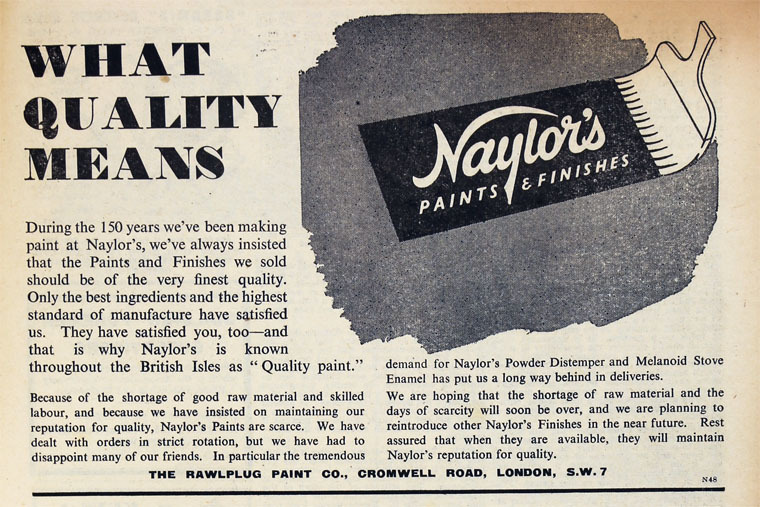 It was precisely the product for the busy building industry, and it rapidly revolutionised the making of fixings into masonry. 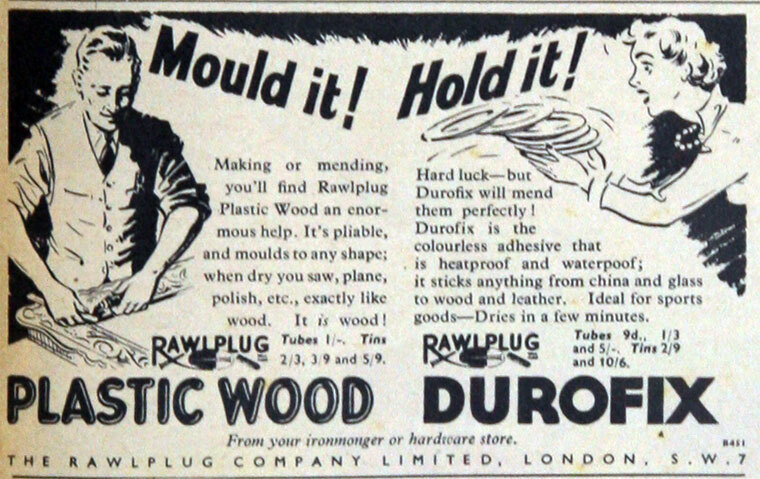 Thousands of pounds were spent on demonstration and advertising to convince trade and public that a small plug could make a stronger fixing than the much larger wood plug used at the time. 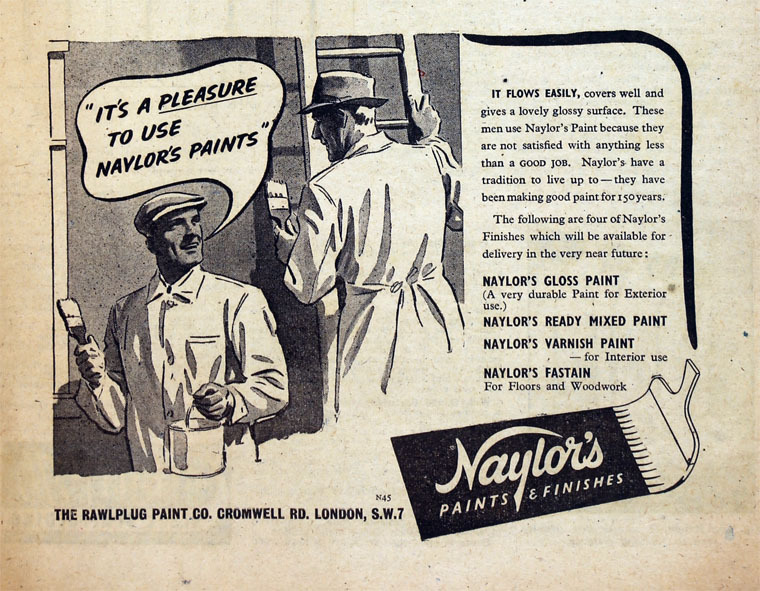 In its early days, the company caused a trade sensation by taking the whole front page of the Daily Mail. 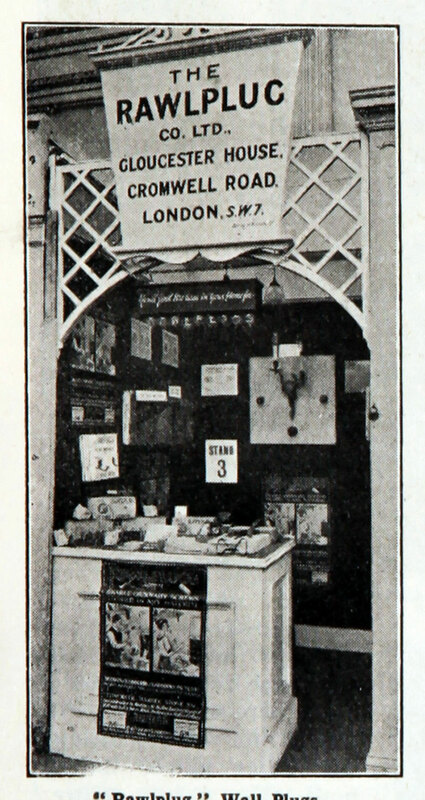 This paved the way for retail stockists to advertise in such a manner. 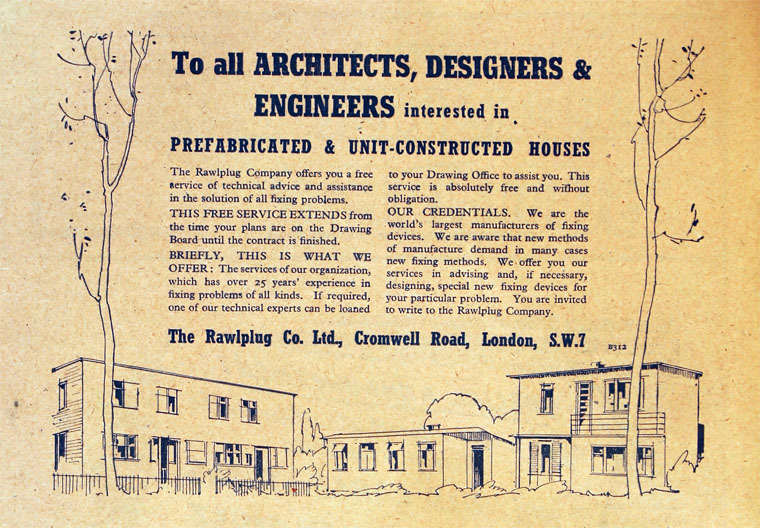 1920 Demand grew rapidly and large scale production was started. 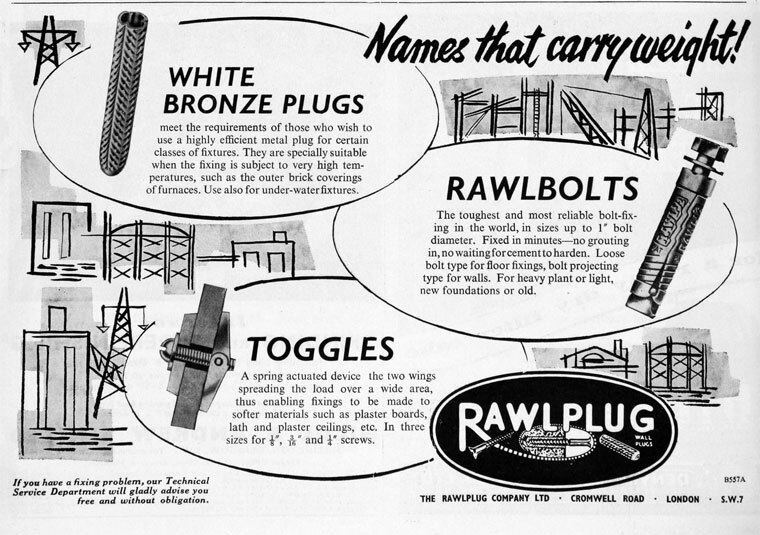 Rawling's Rawlplugs started not just a company but a worldwide industry, and added to many languages a new word as generic for fixings as a Singer for sewing machines and Hoover for vacuum cleaners. This analogy was to prove fruitful for years to come. 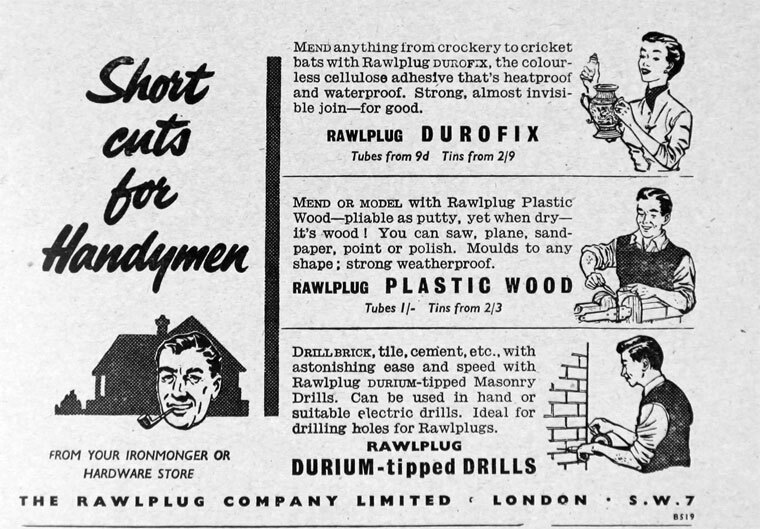 A new industry was on the way. 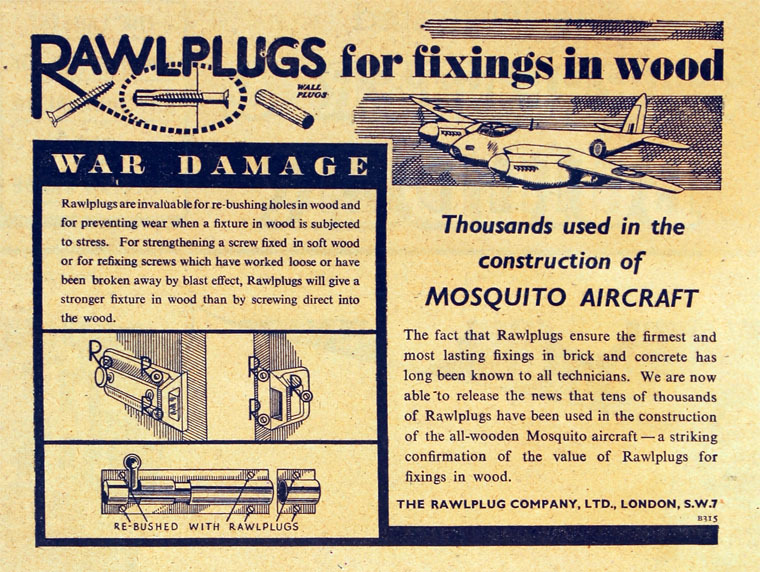 The inventors who developed the simple, effective, Rawlplug had now embarked on an exciting adventure that was to lead to the development of a full range of fixing devices. 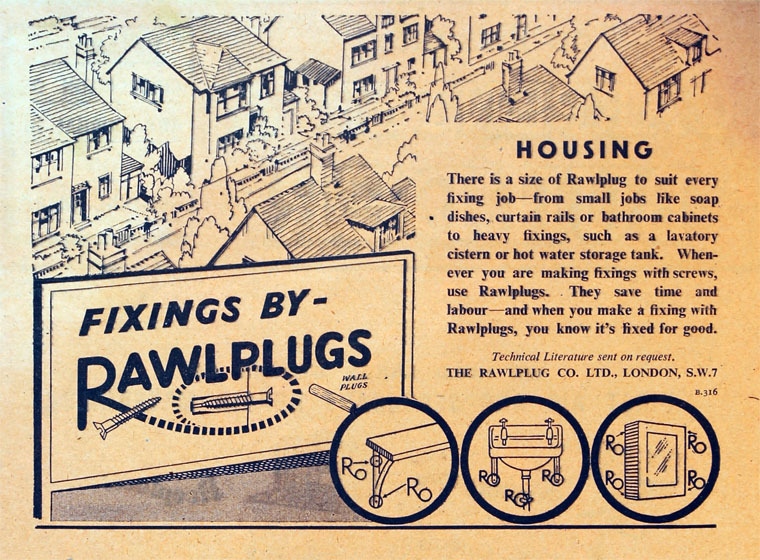 The success of the Rawlplug caused Architects, Civil Engineers, Builders, Electricians, and Plumbers to reveal a host of fixing problems. 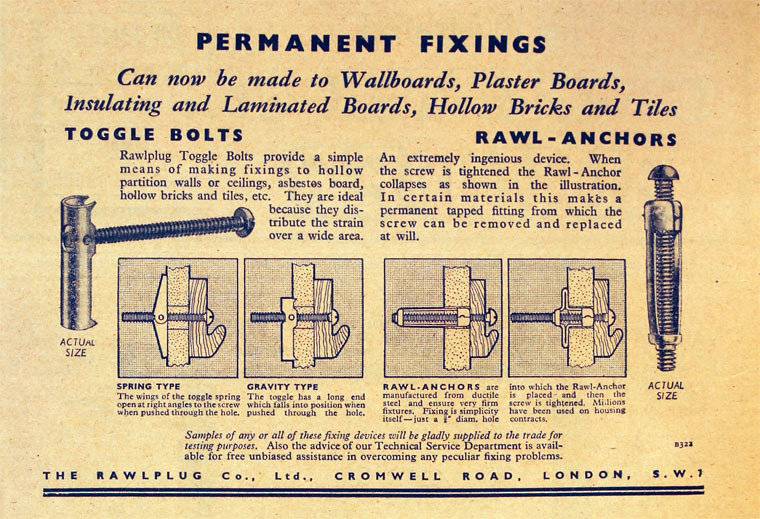 1930s the increasing use of the then new material, reinforced concrete, led to the development and introduction of the patented Rawlbolt Anchor - the first ever mechanical fixing launched on the market. 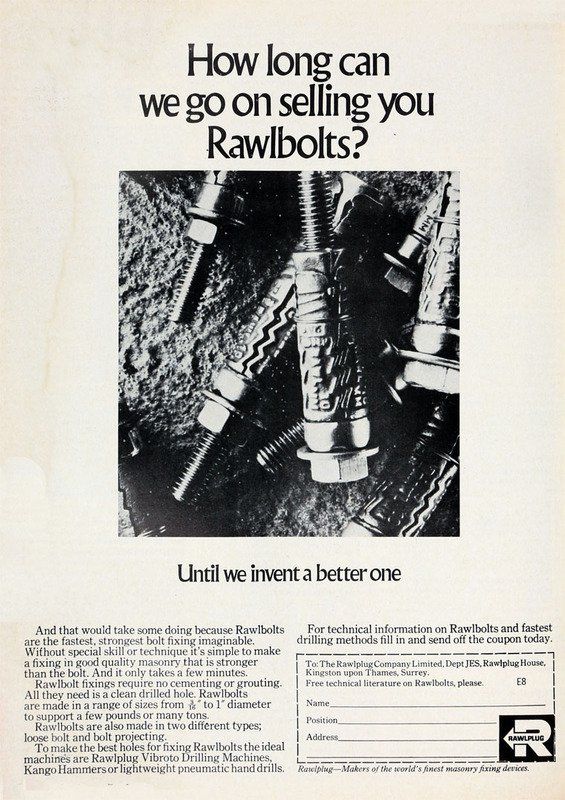 Rawlbolt overcame many of the problems associated with this then new kind of substrate, like fixing machinery to floors and walls. 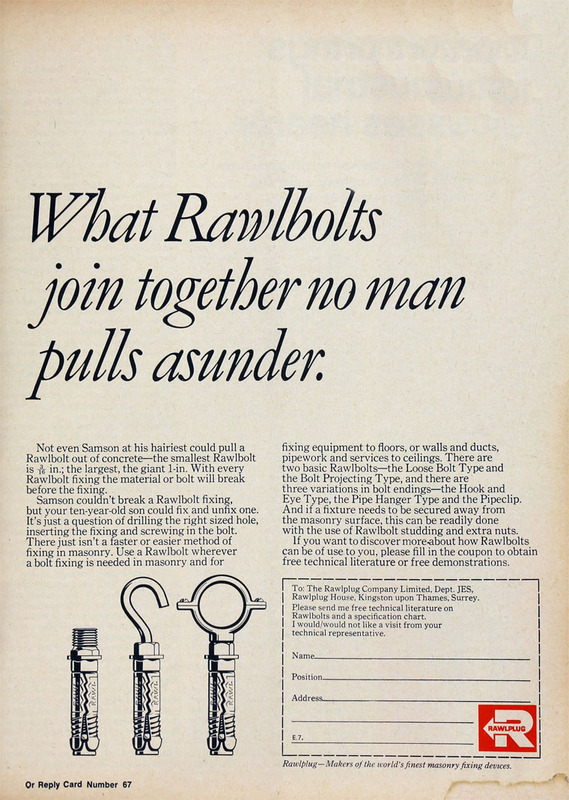 The Rawlbolt Anchor has been further developed many times since then and, over 70 years on, is still an industry standard. 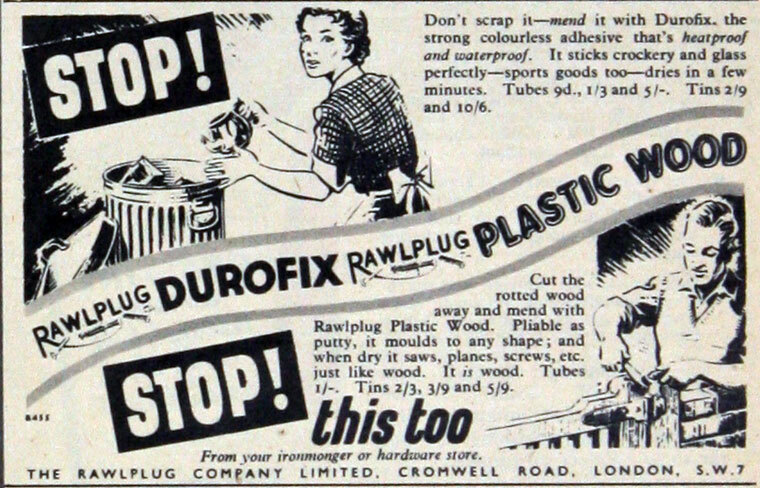 1960s Plastic replaced the fibre of the original plug. 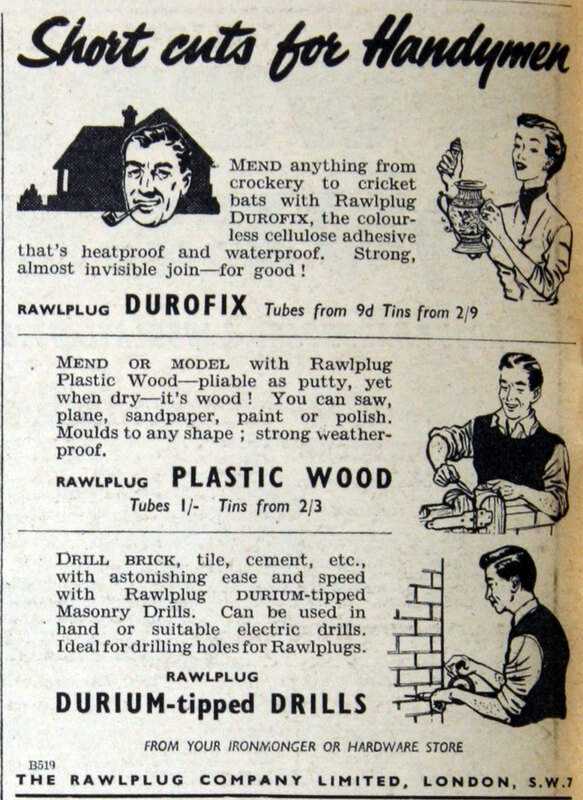 Dramatic strides in construction techniques led to the continued development of appropriate new innovative products. 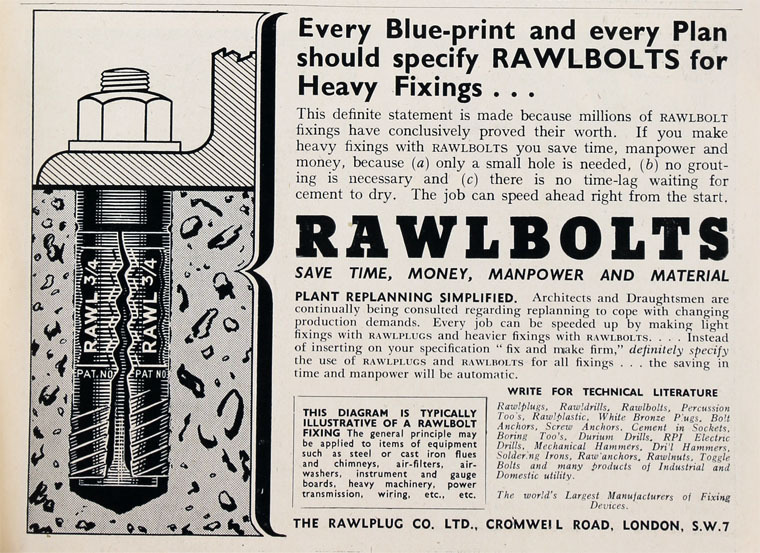 These include the Rawl SafetyPlus, designed to meet safety critical applications, as well as a Rawl bonded anchor range in cartridge and capsule form, first introduced in early 70s, and R-HPT Throughbolts for use in cracked concrete. 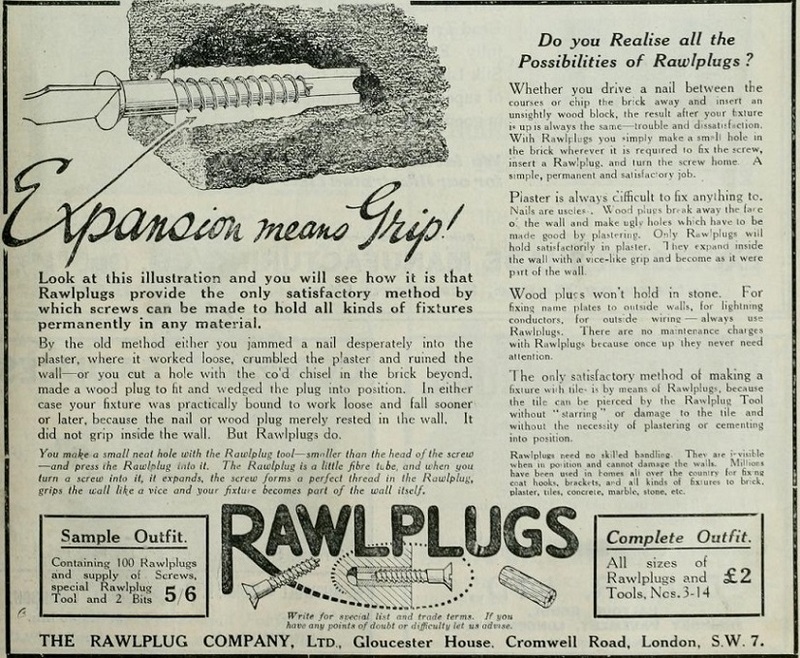 1970s/80s With the boom in DIY activity that followed in the 1970s and 80s the product and the name Rawlplug became household names. 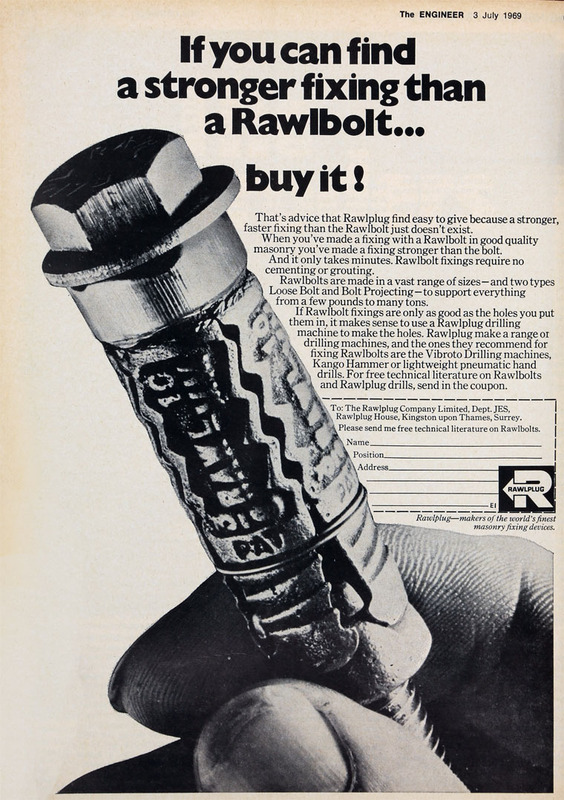 1985 Rawlplug was acquired by Williams Holdings. 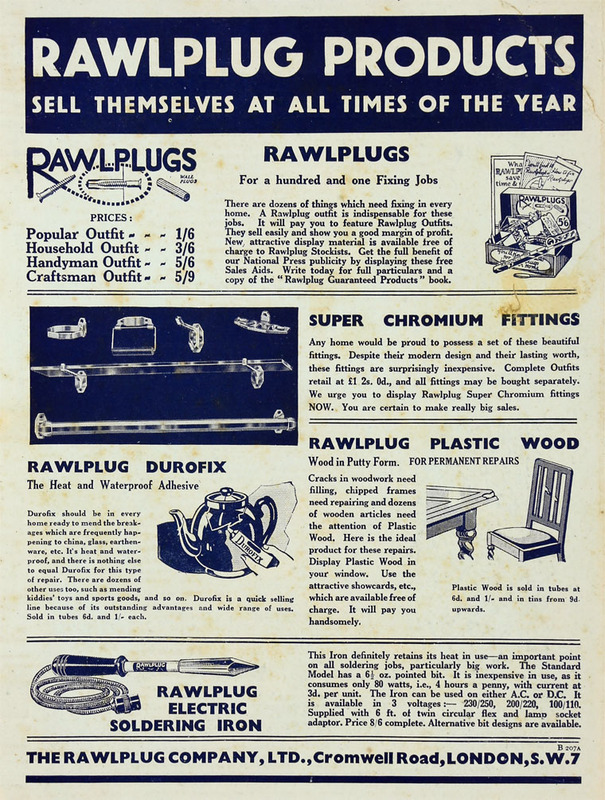 Rawlplug have their own website - see below. 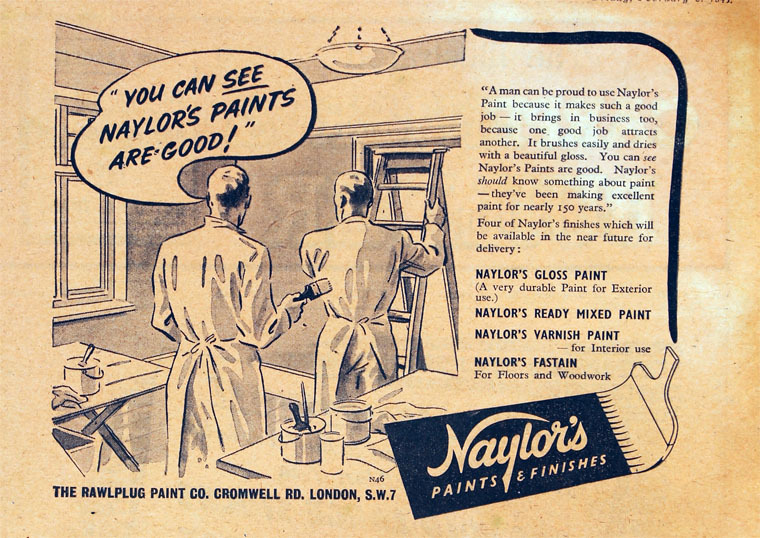 This page was last edited on 16 April 2018, at 10:56.